If you want to know how investors really feel, look at what they're doing with their money. Listening and talking with folks can give you insights into what they believe. But people don't follow through with every idea they share. And they often only have the fortitude to speak, not act. That's why watching real dollars is more powerful. It's the most valuable way to learn what investors believe. A big rush of dollars into (or out of) an idea tells us if sentiment is out of whack. And recently, sentiment toward global stocks hit record negative levels. Investors pulled money out of global stock funds at a pace not seen since 2008. History tells us we should expect 20% gains or more, thanks to this rare event. Fear took hold in December. The worries that hung over markets through 2018 came to a head at the end of the year. Concerns of a trade war, rising interest rates, and falling oil prices pushed global stocks to new lows for the year. Investors took note. They ran for the exits, pulling money out of global stocks at a staggeringly fast rate. Specifically, global equity funds recently saw their largest total weekly outflow since 2008. Investors put roughly $28 billion back on the sidelines. And as I explained above, this kind of "real money" gauge is the most powerful way to get insights into investor behavior. When record outflows take place, it means investors have thrown in the towel. And it tells us the recent pain in the market is likely overdone. Today, investors are scared. They are pulling money out of stocks. Again, we recently saw the largest outflow in global equities since 2008. We haven't seen anything even close to this since 2011. And outflows haven't hit similar levels since 2008. Importantly, record outflows are a contrarian indicator and usually happen near the bottom. Bottoms form when investors are most fearful... And money flowing out of stocks is a great fear gauge. To be fair, the 2008 reading didn't peg the bottom perfectly... It was a bit early. But it still led to substantial profits over the next year, with only a little additional downside along the way. Today, these record outflows are a positive sign. They prove that fear has forced investors out of the market. And we could see a major rally in stocks over the next year as investors get back in. It's scary out there. You can find plenty of good reasons to get scared out of the market. But stocks have already rallied from their December bottom. And history says it's likely the beginning of a sustained rally... not just a flash in the pan. I expect more gains from here as the Melt Up takes hold once again. So my best advice today is to stay long. "How could I invest so confidently after the December crash?" Steve asks. "And why do I believe now is such a great time to buy?" 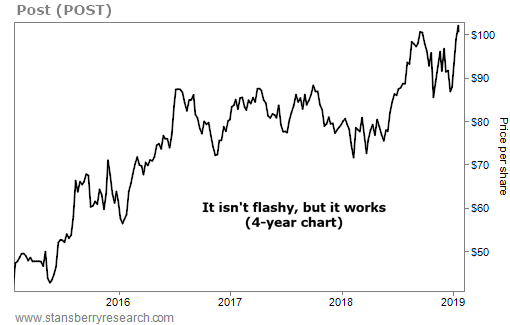 Get the details on two of his favorite "early warning indicators" that are saying now isn't the time to get out of stocks right here. "You should know why I'm buying stocks now... and what I expect from the markets after the frightening gyrations we've seen recently," Steve writes. Learn more about how the buying opportunity today could be up there with some of the biggest successes of his career here: What I'm Doing With My Own Money Right Now. Post (POST) is a $6.7 billion packaged-foods giant. The company boasts popular cereal brands like Honey Bunches of Oats, Fruity Pebbles, and Raisin Bran. Breakfast cereal isn’t a “high flying” industry, but you’ll find it in pantries all over America. And that means steady sales for Post… In 2018, the company reported sales of $6.25 billion, a 20% increase over the year before.